The North Carolina Courage wrapped up the NWSL Shield with a 4-0 win over the Houston Dash on Wednesday night at H-E-B Park in Edinburg, Texas. The win is the Courage’s 12th shutout of the regular season, a new NWSL record for most shutouts in the season. They are now 16-6-1 (49 points), which ties them with the 2014 Seattle Reign for most wins in a single season. North Carolina scored four goals in a game for the first time this season. It didn’t take long for the Courage to get on the board. They made it 1-0 in the 13th minute after a quick restart by defender Abby Dahlkemper. She passed to Sam Mewis who fired it past Dash goalkeeper Jane Campbell for her sixth goal of the year. 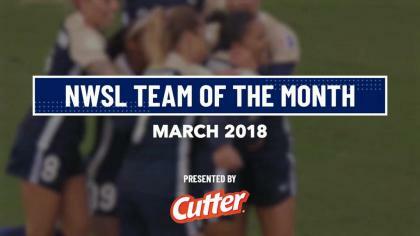 The Courage made it 2-0 in the 38th minute after a wonderful individual effort from Lynn Williams, the reigning NWSL MVP. It’s the seventh goal of the season for Williams. Midfielder Debinha made it 3-0 in favor of the Courage in the 51st minute. Rookie forward Ashley Hatch scored her seventh goal of the season in the 56th minute to make it 4-0. Hatch and Williams are tied for the team lead with seven goals this season. Williams, Hatch and Debinha all finished the game with a goal and an assist each. Goalkeeper Sabrina D’Angelo made her first start since May 27. She made four saves to pick up the record-setting shutout for the Courage. The Courage will wrap up the regular season with a home game on Saturday night vs. the Orlando Pride. It could be a playoff preview — if the season ended today, the Pride would have the No. 4 seed, meaning they would face the Courage in the semifinal on October 8 in North Carolina. Both teams have already clinched their playoff spots. The Dash (7-14-2, 23 points) wrap up their season on the road vs. FC Kansas City on Sunday, October 1. Match ends, Houston Dash 0, North Carolina Courage 4. Second Half ends, Houston Dash 0, North Carolina Courage 4. Foul by Nora Holstad Berge (North Carolina Courage). Attempt saved. Rachel Daly (Houston Dash) right footed shot from outside the box is saved in the centre of the goal. Offside, Houston Dash. Cambria Privett tries a through ball, but Nichelle Prince is caught offside. Sabrina D'Angelo (North Carolina Courage) wins a free kick in the defensive half. Attempt blocked. 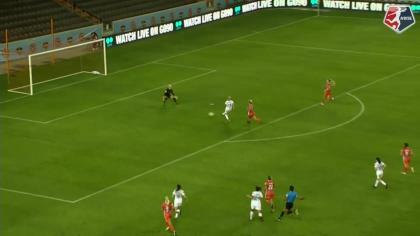 Kristie Mewis (Houston Dash) left footed shot from outside the box is blocked. Assisted by Cari Roccaro. Janine Beckie (Houston Dash) wins a free kick on the left wing. Hand ball by Ashley Hatch (North Carolina Courage). Camille Levin (Houston Dash) wins a free kick in the attacking half. Attempt saved. Janine Beckie (Houston Dash) left footed shot from the right side of the box is saved in the bottom right corner. Assisted by Rachel Daly. Kristie Mewis (Houston Dash) wins a free kick in the attacking half. Attempt missed. Janine Beckie (Houston Dash) left footed shot from the centre of the box misses to the left. Assisted by Camille Levin with a cross. Substitution, Houston Dash. Janine Beckie replaces Sarah Hagen. Attempt blocked. Cari Roccaro (Houston Dash) header from the centre of the box is blocked. Rachel Daly (Houston Dash) hits the bar with a header from the left side of the box. Assisted by Kristie Mewis with a cross following a corner. Corner, Houston Dash. Conceded by Meredith Speck. Attempt missed. Ashley Hatch (North Carolina Courage) right footed shot from the centre of the box is close, but misses to the left. Corner, North Carolina Courage. Conceded by Bruna Benites. Substitution, North Carolina Courage. Stephanie Ochs replaces Lynn Williams. Substitution, North Carolina Courage. Nora Holstad Berge replaces McCall Zerboni. Attempt saved. Samantha Mewis (North Carolina Courage) right footed shot from outside the box is saved in the bottom right corner. Assisted by Ashley Hatch. Attempt missed. Amber Brooks (Houston Dash) header from the centre of the box misses to the left. Assisted by Kristie Mewis with a cross following a corner. Goal! Houston Dash 0, North Carolina Courage 4. Ashley Hatch (North Carolina Courage) right footed shot from the centre of the box to the bottom left corner. Assisted by Debinha with a through ball. Corner, North Carolina Courage. Conceded by Cambria Privett. Goal! Houston Dash 0, North Carolina Courage 3. Debinha (North Carolina Courage) right footed shot from the centre of the box to the bottom right corner. Assisted by Lynn Williams. Attempt missed. Ashley Hatch (North Carolina Courage) right footed shot from the centre of the box is high and wide to the right. Attempt saved. Sarah Hagen (Houston Dash) right footed shot from the centre of the box is saved in the bottom left corner. Assisted by Rachel Daly with a cross. Second Half begins Houston Dash 0, North Carolina Courage 2. First Half ends, Houston Dash 0, North Carolina Courage 2. Offside, North Carolina Courage. Makenzy Doniak tries a through ball, but Ashley Hatch is caught offside. Attempt missed. Lynn Williams (North Carolina Courage) left footed shot from a difficult angle on the left misses to the right. Assisted by Abby Dahlkemper. Attempt saved. Janine van Wyk (Houston Dash) right footed shot from outside the box is saved in the centre of the goal. Assisted by Andressinha. Samantha Witteman (North Carolina Courage) wins a free kick in the defensive half. Goal! Houston Dash 0, North Carolina Courage 2. Lynn Williams (North Carolina Courage) right footed shot from the left side of the box to the bottom right corner. Assisted by Ashley Hatch. Attempt missed. Makenzy Doniak (North Carolina Courage) right footed shot from outside the box is too high. Assisted by Debinha. Offside, Houston Dash. Kristie Mewis tries a through ball, but Nichelle Prince is caught offside. Attempt saved. Debinha (North Carolina Courage) right footed shot from the centre of the box is saved in the centre of the goal. Assisted by Lynn Williams. Attempt missed. Sarah Hagen (Houston Dash) header from the centre of the box misses to the left. Assisted by Andressinha. Cambria Privett (Houston Dash) wins a free kick on the right wing. Cari Roccaro (Houston Dash) wins a free kick in the attacking half. Attempt missed. Lynn Williams (North Carolina Courage) left footed shot from the centre of the box is close, but misses to the right. Attempt blocked. Sarah Hagen (Houston Dash) right footed shot from the centre of the box is blocked. Attempt blocked. McCall Zerboni (North Carolina Courage) right footed shot from outside the box is blocked. Assisted by Makenzy Doniak. Attempt blocked. Ashley Hatch (North Carolina Courage) right footed shot from the right side of the box is blocked. Assisted by Debinha. Abby Erceg (North Carolina Courage) hits the bar with a right footed shot from the centre of the box. Assisted by Makenzy Doniak with a cross following a corner. Corner, North Carolina Courage. Conceded by Janine van Wyk. Goal! Houston Dash 0, North Carolina Courage 1. Samantha Mewis (North Carolina Courage) right footed shot from the right side of the box to the bottom left corner. Assisted by Abby Dahlkemper following a set piece situation. Attempt blocked. Lynn Williams (North Carolina Courage) right footed shot from outside the box is blocked. Assisted by Debinha. Hand ball by Sarah Hagen (Houston Dash). Attempt missed. Sarah Hagen (Houston Dash) header from the centre of the box misses to the right. Assisted by Amber Brooks following a set piece situation.